23rd November, 2006. In this issue: New ExplorOz Stickers, Christmas Special, ExplorOz Website Updates and New Member Benefits for online Shoppers. It’s that time for another fortnightly newsletter and isn’t it amazing how fast the weeks go by. Before you know it, we will be toasting to another year with a famous Aussie roast and a nice beer or wine in hand. It’s been a controversial week for West Australians, with daylight savings getting the nod for a three year trial starting on December 3rd. It will be a very interesting Summer for W.A. considering the State has rejected the idea for the past 31 years. With only a 2 hour difference between the East and the West coast, this will certainly be more positive for business. We have added some great new products to the ExplorOz Shop for you to put beneath your Christmas tree. Also, browse through our existing titles and get in early while we still have stock on hand. Due to popular demand this product is now available and ready for despatch!!! Members who are logged on, can order this sticker free of charge with free postage. For non-members this sticker isOnly $5.00 including postage. Perfect for the front or back windscreen, trailer or caravan. From now until Christmas we are happy to offer our customers a free copy of the Checklists & Caravanning Tips Pamphlet valued at $10.00 with every Caravanning with Confidence DVD purchased. This special is valid from today right up until Christmas. Members browsing the Shop will now notice a new feature in how you see a product's price. Certain discounted items, will be even further discounted to ExplorOz Members. Members must be logged on to view the members price. To take advantage of this, click Discount Itemsor visit the Shop and press the “Show All Discounted Items” hyperlink. We hope Members will find this added discount even more incentive to buy from the ExplorOz Shop. But wait, that's not all we have for Members..... we are also extending a 5% discount off allOziExplorer products. Make sure you are logged on to receive these benefits. Note that items selected for discount are altered frequently. Unless you’re looking for it, being BOGGED is often stressful, time-consuming, dangerous and even embarrassing…Until now! MAXTRAX is an innovative new lightweight device that makes vehicle recovery safe, simple, quick and easy. 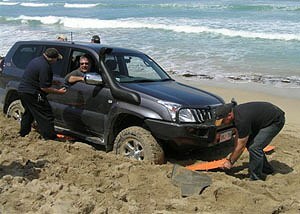 MAXTRAX are designed and manufactured in Queensland, and field-tested in places such as Fraser Island, Cape York and the Simpson Desert. Unlike conventional methods, a MAXTRAX recovery requires no expertise, previous experience, another vehicle or anchor point. Better still, there’s no highly stressed components. It’s as easy as wedging MAXTRAX firmly against the vehicle’s tyres, engaging low range, first gear and GENTLY driving out. As our slogan says, Take the easy way out! MAXTRAX has just been awarded the 4WD Monthly 2006 ‘Best Product’ $250 - $500. ExplorOz is now Skype enabled which means Skype users can contact individual staff members for Live Assistance. Look out for Jackie in the shop as per this image - The icon will show you her current availability to assist with your shop related queries. TheAbout Us page also has Skype contacts enabled for Michelle, David, Jackie and Damian.